When you think of "Like a Virgin," you probably think of Madonna rolling around on the floor or rocking a lacy '80s dress, but now, you can see a nun instead. 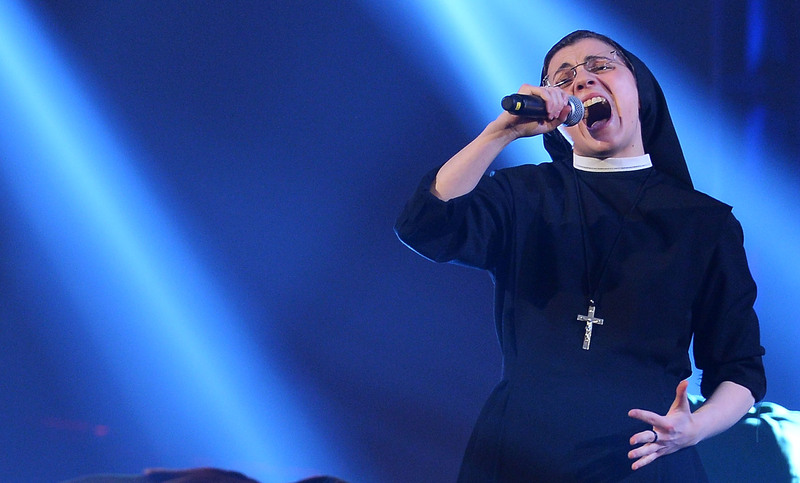 The Voice Italy winner "singing nun" Sister Cristina Scuccia's debut single is a cover of "Like a Virgin" with a spiritual twist. The slowed-down track doesn't alter any words to the original song, but interprets the meaning behind it. Basically, instead of being physically "touched for the very first time," it's about being touched by prayer instead. "I chose it with no intention to provoke or scandalize. Reading the text, without being influenced by previous interpretations, you discover that it is a song about the power of love to renew people, to rescue them from their past,” Scuccia told Italian newspaper Avvenire. She added that it's more of a "lay prayer" than a pop-dance romantic ballad now, and the video certainly proves that. You can take in the beautiful landmarks in Venice, Italy and see gorgeous cathedrals in Scuccia's video. Compared to Madonna's rolling around on a gondola, this is much more serene and sweet. It will be interesting to see what she does in future videos, as she will want to fit her traditional habit attire in to everything.